The Dextre robot will help affix NASA's Robotic Refueling Mission experiment to the International Space Station's ExPRESS Logistics Carrier-4. An experiment riding on the final voyage of NASA's space shuttle Atlantis is set to test out technologies that could be used on future robotic spacecraft. The experiment, called the Robotic Refueling Mission (RRM), is a satellite mockup that Atlantis delivered to the International Space Station when it docked on Sunday (July 10). The experiment will be installed on the exterior of the outpost tomorrow (July 12) during a spacewalk conducted by two space station astronauts. 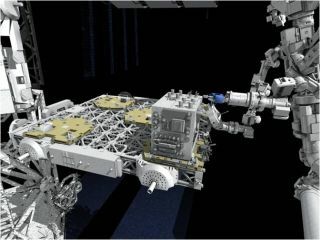 RRM will serve as a trial for the orbiting lab's twin-armed Dextre robot, testing the ability to refuel and otherwise maintain a satellite in space. Scientists will watch carefully how Dextre performs these tasks over the next two years. The information they gather could help pave the way for highly capable robotic mechanics that patrol Earth orbit, fixing or refueling satellites in space. "We anticipate it enabling future missions, future capabilities, for the international aerospace community," Benjamin Reed, RRM deputy project manager at NASA's Satellite Servicing Capabilities Office, told reporters last week at Kennedy Space Center. The Robotic Refueling Mission (RRM) payload box is peppered with refueling components and activity boards. Four unique tools are stowed within RRM for use by Dextre, the twin-armed robot aboard the International Space Station. During tomorrow's spacewalk, one of the two astronauts will affix the RRM box to the exterior of the space station. Dextre, which sits at the end of the station's 57-foot-long (18-meter) Canadarm2 robotic arm, will move the box to its permanent location on the station's truss. Then the robot's dexterity test will begin. Simulated satellite refueling is a major part of this test. This task is tricky and involved, requiring the use of all four tools to access a heavily protected satellite fuel valve. For example, Dextre — guided by human operators in a variety of locations on Earth — will use a cutting tool to snip some securing wires around the valve, then employ two other implements to remove two different kinds of caps. Finally, it will pick up yet another tool to access the valve and introduce the simulated fuel. Such a complex robotic operation has never been demonstrated in space before, researchers said. Dextre will also perform a variety of other similarly complicated tasks. If everything goes well with RRM, the next step would be to launch a mission to a satellite running low on fuel. That could happen by 2013, NASA officials have said. Astronauts have serviced spacecraft in orbit before. Five different shuttle missions, for example, helped fix or upgrade NASA's Hubble Space Telescope. But RRM aims to demonstrate a robotic capability that could apply across many different types of satellites — even those that weren't designed to be serviced. This ability could end up extending the lives of many spacecraft in orbit, saving millions of dollars for the satellites' operators. RRM researchers hope the experiment provides a convincing demonstration that this technology works, and that it's worth pursuing further. "We're going to make this data available to everybody," said Frank Cepollina, RRM project manager at the Satellite Servicing Capabilities Office. "That is, all commercial industry that may want to leap off and start their own ventures." RRM is a joint effort of NASA and the Canadian Space Agency. You can follow SPACE.com senior writer Mike Wall on Twitter: @michaeldwall. Visit SPACE.comfor complete coverage of Atlantis' final mission STS-135 or follow us @Spacedotcom and on Facebook.